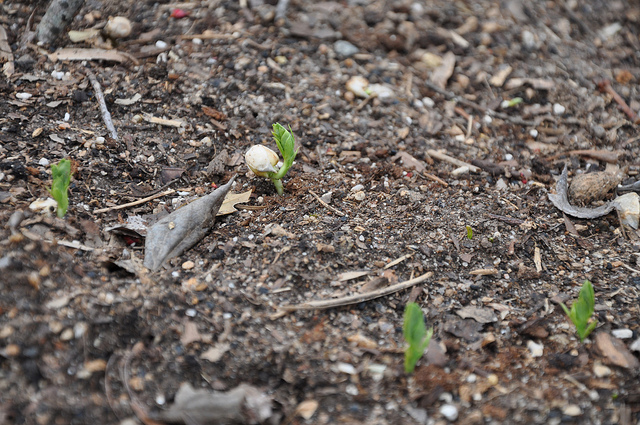 Some time ago, I planted peas in my garden. This is what they look like now. I'm so excited! I have peas! Actually, to state it precisely, I don't really have peas. I have sprouts. 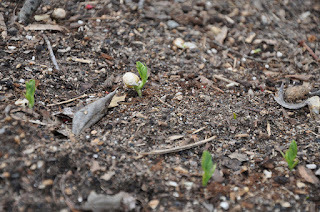 If I care for the pea sprouts and pull out the sprouting weeds, if I train the tiny plants to climb the poles, if I keep the slugs and beetles away, if I water them with some regularity, then I am likely to have peas next month. But I have peas! I know I have peas. I just can't see them yet. Father spoke to me through this. "It's only those who recognize my move when it is in its infancy, who bless it when it's only a sprout, who will be qualified to be a leader in the movement when it is bearing fruit." There was a gathering last weekend, a convocation, of some of the prophetic folks of the Northwest (notes are here: http://nwp.link/If5Xgl). The one thought I heard over and over again was different prophetic folks saying, "It's here. The move of God has already started, but it's only in sprout form just yet. Now my job is to recognize the peas, the awakening, the move of God. My job is to to nurture the tiny sprouts, to train them to climb the poles on their own, to keep the pests away, to water them once in a while. It's going to be a glorious harvest! As a young man of 26 serving the Lord I too see the sprouts. The Lord guided me to the book of Joshua. This past weekend it was made clear to me that the drought is over, there is a new season in the Kingdom - He's allowing us to enter the Promise Land by experiencing the full measure of his Spirit. The Lord has planted seeds and those hearts have been watered. So, I am in agreement. Currently leaders must be sensitive because hearts need to remain nourished and it's up to the radical, the daring, those that truly LOVE Jesus to RISE UP. He's willing, so you must willing regardless of age, height, weight or color to answer the the noblest of all callings. I've been overwhelmed due to numbers, but surely enough I've prayed for laborers and God has answered. He will answer your prayers too!